Easily accessible by scenic State Route 177, Kearny rests in the heart of the Copper Basin, near the Gila River. Kearny’s history stretches back to the early 1800s when Arizona explorer Padre Eusebio Kino sought to convert the area’s Apache communities to Christianity. In the late 1800s, Gen. Stephen Watts Kearny, the town’s namesake, made camp near the Gila River at the base of the Pinal Mountains. Leading the “Army of the West,” Kearny led his troops to Santa Fe, then on to California in 1846. In 1958, Kennecott Mining Company built Kearny for former residents of Ray, Sonora and Barcelona, which were swallowed up when the company expanded its open-pit copper mine. Like a desert oasis, Kearny has two bodies of water for cooling off. One is Kearny Lake, which is stocked with largemouth bass, and offering a campground with dry camping for less than $20 per night. The other is the Gila River. Spanning the river, on the Florence-Kelvin Highway, is the new “‘Jake’ Jacobson Bridge of Unity in Memory of Stephani Yesenski,” completed in June. Jacobson is chief operating officer of Copper Basin Railway and Yesenski was a 20-year-old Riverside resident who inspired many prior to her death in 2000 from cancer. 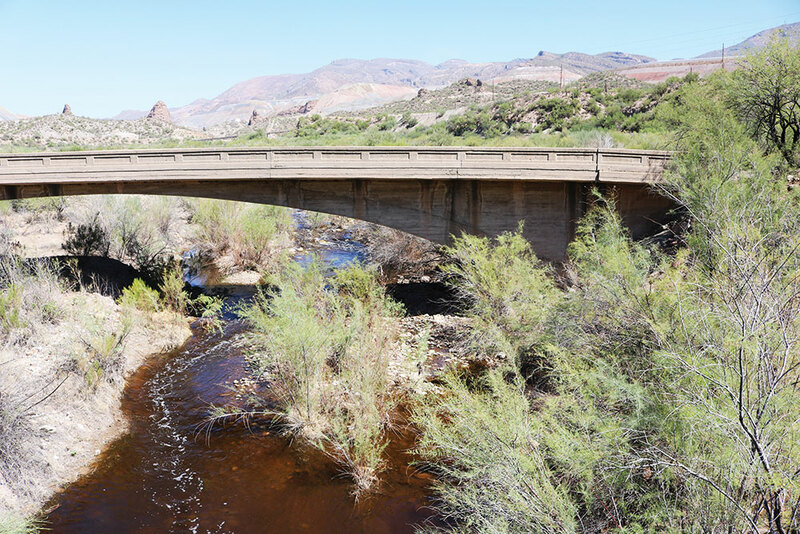 Built in 1916, the old Riverside Bridge is now a footbridge connected to the Arizona Trail. ASARCO Mine’s public lookout, on Mineral Creek Road, offers panoramic views of the Gila River Valley. Kearny also boasts one of Arizona’s best developed ATV trails, known as the Mescal Mountains Off-Highway Vehicle Recreation Area. At the Kearny Golf Course, golfers can play a round of golf with the scenic Pinal Mountains as a back drop. Kearny visitors will also find amenities in town such as grocery, hardware and auto parts stores; banking, ATM machines, a pharmacy and medical facilities. Local eateries include Old Time Pizza and Buzzy’s Drive In, a longtime local hangout. Kearny is only a 90-minute drive from Metro Phoenix, and about 30 minutes from Globe.